Nauset Marsh Trail On Cape Cod At High Tide. 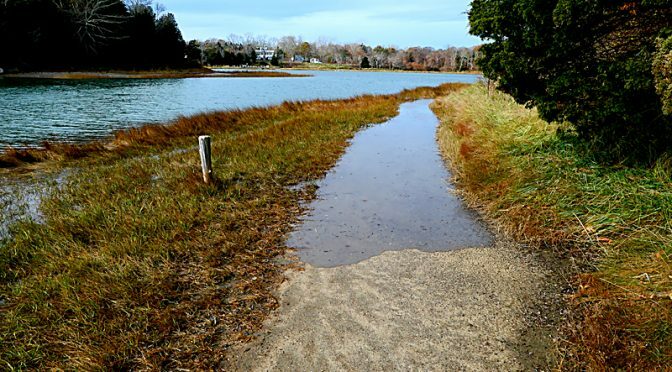 You can see the water coming in pretty fast on the Nauset Marsh Trail by the Salt Pond in Eastham and there was still almost an hour until high tide. Thank goodness there is a trail up a hill that circumvents the rising water or you would be wading pretty deep. Make sure you always check the tides if you are hiking or walking near the ocean or the marsh. You never know just how high that water will come and you don’t want to be stuck on the wrong side! Previous PostCape Cod Bay Flats At Dusk Were Spectacular!Next PostWinter At Rock Harbor On Cape Cod.